I wanted to share this peaceful moment with you. Thanks for all of the hard work you do for these wonderful dogs. 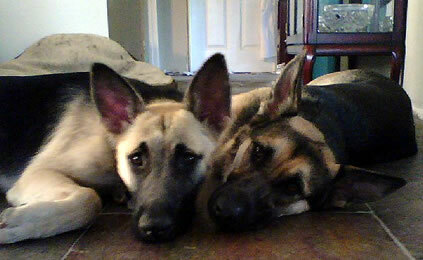 Julie (aka Ava) is on the right was rescued in 2005 she was Shyann’s puppy born in closet. Max (aka Oliver Twist) was the poor puppy that was covered with over 100 ticks in 2006 from Perris. He weighs about 75 pounds now. The old saying what does not kill you, makes you stronger. He is pure muscle and even knows how to open french doors on his own to go outside. I was amazed to see him as a poster boy on the incredible video that was on the GSR web site. It is hard to believe it is the same dog.